Hi everyone. 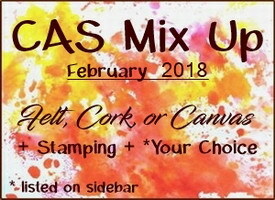 Today is the start of the CAS Mix Up February Challenge. This month's challenge is being hosted by our very talented and creative Design Team member, Joanna. Lots of scope as you are welcome to use Felt, Cork, OR Canvas along with stamping and one item from the *Your Choice list on the challenge blog sidebar. I started off the challenge using a piece of canvas that was gifted to me by Bonnie. Thanks Bonnie! The only canvas I have worked on before was framed. :) To see my dirty pour canvases from last year, click HERE and HERE. I was inspired to make a small version for a card after seeing a card made with leftovers from a dirty pour done by Cathy (Cathy's Card Spot). I finished by stamping a sentiment from STAMPlorations in black ink. Just perfect for my card. Here's a close-up of just the painting. You can see the texture of the canvas. We are excited to have Marianne (Marianne's cards 'n stuff) as our Guest Designer this month. Welcome Marianne!! Check out the challenge blog to see Marianne's card, along with the amazing cards from our talented design team. And then come play along! Wow..Stunning Canvas Dirty Pour mini "Work of Art", Loll. I LOVE your colors and framing. You have really inspired me to try a mini canvas, my friend. Thank you so much for sharing. Hugs.. Such a magical card, love the potion mixture, ...which is so well dosed. The world, is definitely YOUR canvas. Such an eye catcher for a card, great idea. This looks like a piece of an exquisite modern art painting! LOVE this and would love having a full version of it. 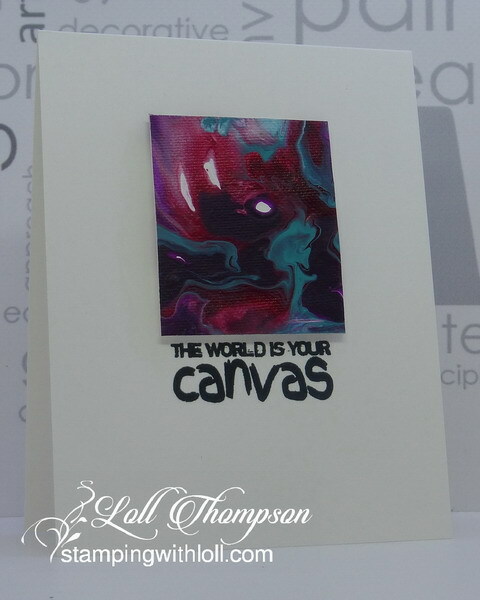 Doing this small piece was brilliant to use on a card- and something that looks So fun to try. Thanks again for the inspiration! That card is just gorgeous! Wonderful mix of colours and amazing patterning on such a tiny canvas - I'd have been worried I'd get just one big blob of muddy colour. It's perfect with that great sentiment and nothing else. 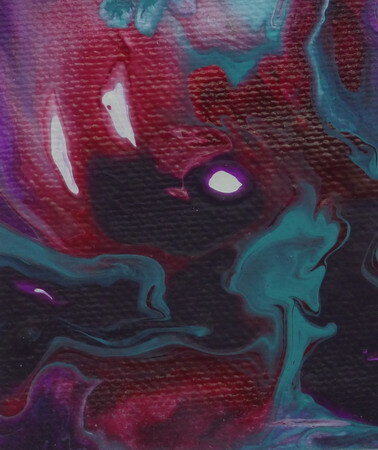 I love the wonderful patterns of the "drips" and the fantastic colors, Loll! A wonderful artsy card, my friend! That looks amazing, Loll! Wow! The texture is fabulous. Thanks for sharing! 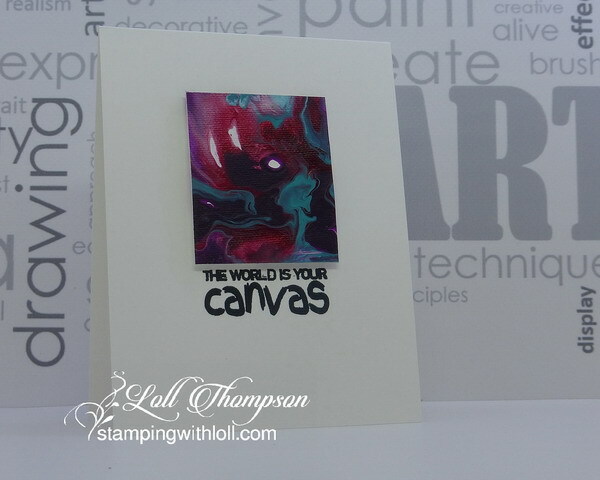 Love your mini canvas on a card! It looks spectacular! If you would like it in large to hang on your wall, all you have to do is make one, *wink*! I've never heard of 'dirty pour', Loll, and my fear is that it would really be dirty/muddy. Yours turned out so well I may give it a try. I found some canvas when I cleaned out a drawer the other day. So artsy, vibrant and unique. Love it. I’ve never worked with canvas... this is completely outside of my wheelhouse.